shopnewbalance.com: For better results, just look in the mirror. For better results, just look in the mirror. You see them every day. The guys at the gym who make you cringe because, by the way they sling around their weights, you just know they’re going home with an injury. You, on the other hand, are careful. Checking yourself in the mirror. Making sure you don’t overextend your movements. That’s because you know that to get the most out of your workout, you have to maintain proper form. Well now you have another tool to help you do it—the Align collection from New Balance. Designed just for men, Align features strategically placed graphic bands on the sleeves, chest, abdomen and back so you can easily check yourself in the mirror. You’ll see where you need to be to maximize the movement of upright rows, military presses, bicep curls and more. The lines are visual cues that ensure you maintain proper form, focus your attention and push your workout further. It’s a difference you’ll see not only in the mirror during your workout, but in your body long after. Will the Align collection help you lift more or lift longer? No. But by helping you make the most of every move, it allows you to work out smarter. 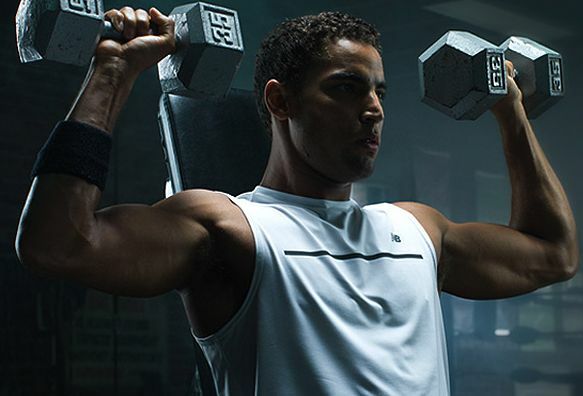 Plus it has the moisture-wicking and cooling technologies found in all New Balance men's performance apparel, so you can feel great while you’re focusing on your routine. Using mirrors to check for proper form may not be anything new, but New Balance has taken that practice a step further with the introduction of the new Align Collection for men. Check out the entire line here. And keep practicing good form.